150 million years ago the air was full of flying reptiles, some of which were called Pterodactyls, but there were no birds. But today, through extensive research, it is now virtually proven that birds evolved from dinosaurs. This was established by the discovery of fossils such as Archaeopteryx, which was the size of a crow and was found in Germany and dated 150 million years old (The Jurassic). Since the discovery of Archaeopteryx there have been other finds which have filled in the missing link between Archaeopteryx and dinosaurs which have shown evolving birds with both scales and feathers, it also seems that birds evolved from the species of dinosaur which led to the development of the ones called Raptors, you know the ones in the film "Jurassic Park" which kept eating everybody, and not from the Pterodactyls as was first thought. If anyone has any thoughts on this subject why don't you drop me a line just click on the PiedPiper button at the bottom of the page. So why do we have to give birds a hard time? Well, the majority of birds are fine and in any case are covered by the Wildlife and Countryside Act (schedules I & II) and let's be honest who, in their right mind, would want to arrange the demise of a little old Robin? Fouling buildings, blocking of down pipes and gutters thus causing buildings to become damp. One case I know was a bank which had let the bird problem get very bad (because they didn't use the upper floors) that in turn did so much damage to the building that it cost about £100,000 to rectify the problem, this included proofing the building to stop a recurrence as well as the structural replacement and repair that had to be carried out. Large bakeries where there is a problem with sparrows getting in to eat the crumbs and at the same time fouling various products. Supermarkets, where birds have gained entrance to the sales floor where they have everything that they need, food, green plants, heating, nesting in the beams etc. But at the same time they also foul the products which you go in and buy. Farms, where birds in large quantities get into the feed areas to feed themselves but whilst they are feeding they are fouling the product, when this is fed to cattle or pigs it gives them diarrhoea and consequently it takes longer to bring them up to body weight before they can be sold, which costs more money. Fouling the pavements in cities when birds (mostly starlings) roost in trees at night and people have slipped on the fouling and have been injured, and later claim against the council involved. Bird strike at airports, where flocks of birds can hit the cockpit glass or be sucked into the jet intakes. Birds nesting in roof spaces and thus bringing in the accompanying insects, which when the birds have flown, can infest the house involved, things like bird mite, bird flea, Dermestes beetles, Spider beetles etc. The list goes on, so you can see that although it is a sensitive subject, it is one which has to be addressed otherwise there would be a lot more disease and food taint that we have at the present. There are various ways in which birds can be prevented from encroaching into our environment and a good site to go to, who specialise in this subject is Network Pest Control Systems, mind you they also deal with a lot of other problems as well. Avistrand: a thin stainless steel cable covered in a polymer, which is strung along ledges and window sills, in fact anywhere that you can drill a hole. Stainless steel posts are put in and the cable is attached on springs, the idea being that the bird can't perch on the wire because of it being sprung. Bird repellent: this is a type of polymer or sealant which doesn't set, this is extruded along ledges in various ways, a skinning fluid painted on so that the birds don't get stuck into the repellent, when the birds land on the compound it feels insecure under foot and they fly off again. The down side to this treatment is eventually it goes off and also it is very vulnerable to window cleaners. Types of thin wire spikes: (which don't hurt the birds) and are set into a plastic base, these are glued onto various surfaces and again it dissuades the birds from landing. Some of the trade names are E-Coppic and Avipoint, they come in various shapes and sizes and are quite efficient. Netting: which comes in various colours and can be used to net off the whole front of buildings if necessary, if carefully done and the colour matched correctly, it is not as visible as you might think. This method is also used under bridges, loading bays, dead spaces etc. The main points in this method are making sure that there are no gaps so that birds don't get trapped behind the net and die under stress. Also the net should be tensioned correctly. If access is required to areas behind the netting then large zips can be fitted. Shooting: sometimes has to be carried out when there is no other alternative, for example where sparrows may have gained entrance into a supermarket and have decided to live on the sales floor and warehouse areas, let's face it they have everything that they want. Believe me it is not a job I relish, apart from the fact that I don't like shooting birds, I have been called murderer and all sorts that I wouldn't repeat. Usually from people who let the birds into the store in the first place by leaving doors open or pinning the strip curtain back because they couldn't be bothered to push through it. Narcotising: is carried out when there is a presence of pest birds mixed in with song birds or protected birds. Narcotising has to be carried out with the permission of the Ministry of Agriculture Fisheries and Food (MAFF), and sometimes they might even want a representative there when you do the job. Alphachlorolose is mixed with crumbed Madeira cake or some similar substrate, it is then put down in piles which are numbered on a plan, for retrieval purposes. As the birds eat the cake they fall asleep the pest birds are put down with CO2 gas and the remaining birds are put into heated recovery boxes and then let go. They feel no pain I must add. Trapping: again is a labour intensive job and hence can be expensive. It involves pre-baiting trapping cages for at least a week both morning and evening. Once the (usually) pigeons are confident and moving in and out of the cages eating the bait, the traps are then set. Again birds are disposed of by gassing with CO2 which is painless. Once having caught a few birds, pre-baiting may have to be carried out again to gain any remaining birds confidence, as I said labour intensive. Mist Netting: is not used very much these days by pest controllers, though it is by ornithologists. This is a very fine type of net, so fine that the birds can't see it, it is set up on frames and the birds fly into it and are caught. The problems arise when trying to get the birds out of the net. 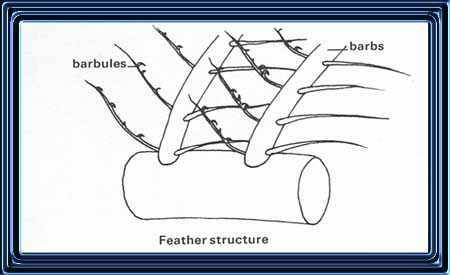 Because it is so fine the net tangles in the feathers in barbs and barbules thus making it difficult to free (a close up of a feather is shown below), this also causes the bird a lot of stress due to too much handling. So click on the links above if you want any biology of pest birds, e-mail me by clicking on the Piedpiper or you can click on one of the buttons below to go to a different subject...!